First a Quick Announcement: Our VBA Class enrollments will be closed this Friday (Sep 16). If you want to learn VBA & Excel, please consider joining our course. More than 120 students have already joined us in the second batch and are learning VBA as you read this. Click here to learn more about the VBA Classes and join us. 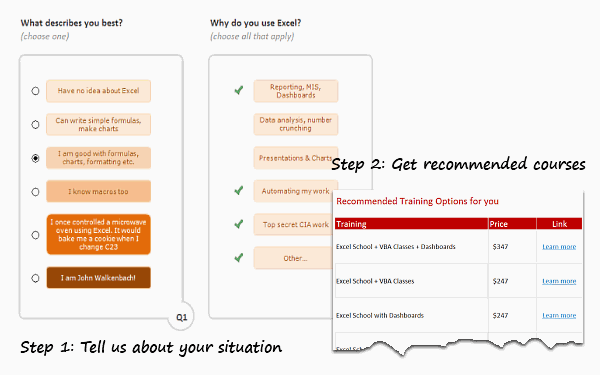 So today morning, I locked my office room and made a beautiful Excel workbook that asks you only 2 questions and tells you which training programs are best for you. Try it here. 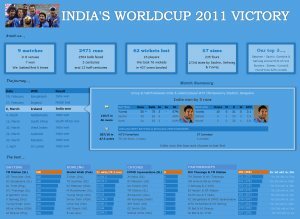 Celebrating India’s Worldcup Cricket Victory – In Excel Dashboard Style! I know I am late to the party, but better late than…, uh! forget it. As the keen readers of our blog knew, I like cricket and I show my enthusiasm by making an excel dashboard (or info-graphic) whenever Indian team reaches a major milestone. So naturally, I was super excited when we won the ICC World cup 2011. Last time Indian won the event was in 1983 and my idea of a dashboard at that time was a bottle of milk and jingo-bell, my favorite shake-to-make-annoying-noise toy. 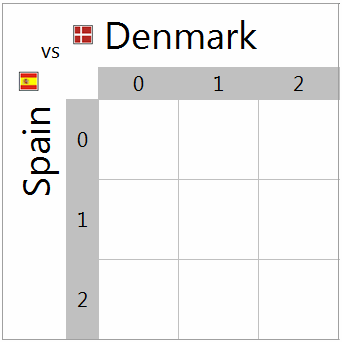 I think our latest world-cup victory deserves something more than that. So here we go. There are beautiful, powerful & awesome charting examples all around us. Today, I want to show you how we can harness the power of Excel to create Analytical Charts. 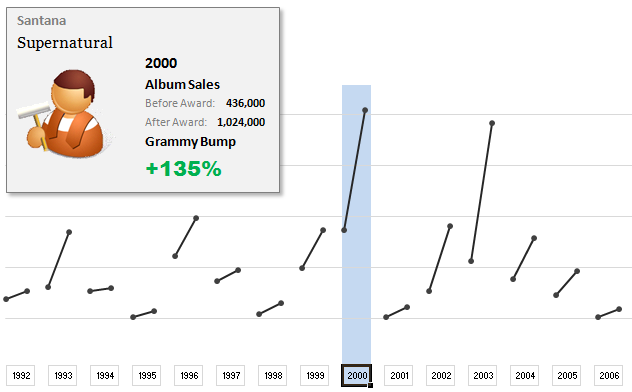 The folks at Washington Post made an interesting chart to understand whether winning a Grammy award makes any difference to album sales. Go ahead and browse it if you have not already seen it. Go, I will wait. It is an ego chart. We would all instantly search for our favorite artists and learn about how Grammy award changed their album sales. It is a simple chart. No clutter, no gaudy colors, just a bunch of lines and the story is out there. In fact, I liked the chart so much that I wanted to make it in Excel.. You can see a snapshot of what I came up with above. Read the rest of this article to learn more. Happy Birthday Hui, An Excel Dashboard to prove you are awesome! Some of you know our guest author and Excel ninja Hui. Yesterday was his birthday. And I wanted to create nice birthday gift for him. So I took a database dump of our forums data and created a dashboard. Read rest of this post to see the dashboard & download workbook. First some good news, On 21st November, 2010, our little blog received its 10,000th comment! Thank you so much for making this happen. Those of you reading chandoo.org for a while know my penchant for comments. I have learned a lot of excel tips & ideas just by reading the comments you posted on this blog. I think comments are one of the best parts of this blog. So, naturally, I wanted to celebrate this milestone, with something big & awesome. My intention was to download all the 10,000+ comments and play with the data to come up with something outstanding, like a dashboard. It took me 2 days to conceptualize and create this beauty. Today I want to introduce a new excel feature to you, called as Picture link. Well, picture links are not really new, they are called as camera snapshots in earlier versions. They provide a live snapshot of a range of cells to you in an image. So that you can move the image, resize it, position it wherever you want and when the source cells change, the picture gets updated, immediately. 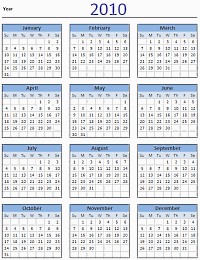 Here is a 2010 new year gift to all our readers – a free 2010 calendar excel file (a little secret: just change the year in “outline” sheet from 2010 to 2011, to get the next years calendar. It works all the way up to year 9999). You can even get a Printable PDF Calendar. There are 14 different sheets in the calendar file. First one is an outline calendar for the entire year. The next 12 are monthly calendars. And the last sheet shows a mini-calendar for the year 2010. Read the rest of this post to know more and download the calendar. 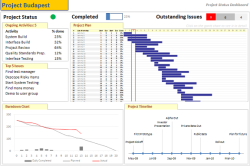 Project management dashboards, project status reports help stakeholders, project sponsors and team-members can understand project status very quickly. In the last installment of project management using excel, learn how to make project management dashboard using excel in this tutorial. 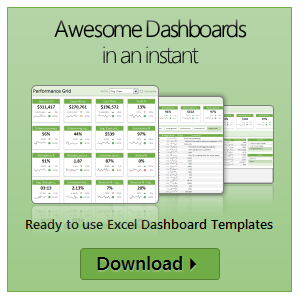 Also download the excel project status dashboard template. Camera tool is your way of creating visual reference in an excel sheet. It is one of the useful and hidden features of excel. Here is how it works. You specify a rectangular area in your workbook and camera tool creates a mirror image of that area as a drawing object. You can move it or resize it. And whenever the contents of original rectangular area changes (charts, drawings or cell values) the mirror image changes too.